Sint Eustatius, often referred to by its nickname Statia, is located in the northern Lesser Antilles, and is part of the St. Kitts island bank. Although little-known, it boasts a rich and unique natural heritage. Statia’s dormant volcano, The Quill, features seven types of tropical forest, including a distinctive ecosystem inside its forested crater. To see a collection of photos taken for the book, click here. 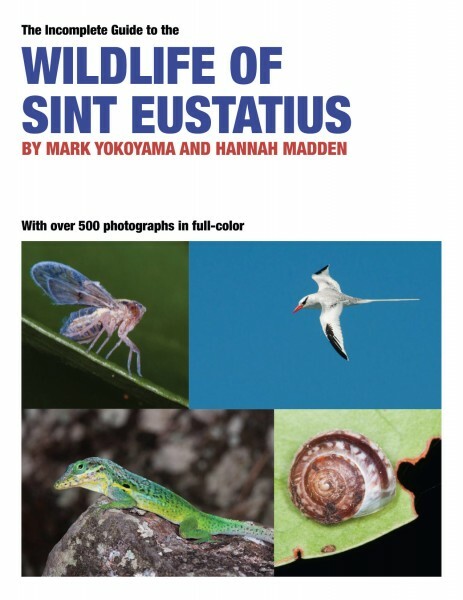 The Incomplete Guide to the Wildlife of Sint Eustatius is currently in progress. Field work for this book began in September 2013 and a release date is targeted for September 2014. The book is being written by Mark Yokoyama and Hannah Madden, and the project is being managed by the Les Fruits de Mer association. We are currently seeking additional funding for fieldwork and production, to get involved, please contact us. Mark Yokoyama is a naturalist, author and wildlife photographer living in Grand Case, Saint Martin. He holds a degree from Harvard University and is an avid entomologist – a lifelong passion that was sparked early in his childhood and led him to serve as president of the Oregon Entomological Society at the age of fifteen. In 2008, he co-founded the world’s first extreme shallow snorkeling team, Les Fruits de Mer, and began exploring the shallowest waters of the world for pleasure and science. After moving to Saint Martin in 2009, he took to the hills to study and document the wildlife of the island. He published the first edition of this guide in 2010. His mission is to promote knowledge of the unique ecology of Saint Martin to its people and to the world – especially to children. He conducts ongoing field research on the island, and shares his wildlife expertise with school groups and the general public. Hannah Madden has lived on St. Eustatius and worked for St. Eustatius National Parks (STENAPA) since 2006. She is responsible for a variety of terrestrial research and monitoring, including bird, butterfly and orchid surveys. She has a vast network of contacts across the Caribbean and has worked with scientists, researchers and experts from institutions such as New York Botanical Garden, University of Puerto Rico, Clemson University, Berkeley College, Coastal Carolina University and much more. Many of these collaborations have been so successful that they still continue today. She is the co-author of a number of publications relating to Statia’s flora and fauna, and even has a species of tarantula named after her. Hannah holds a Bachelor’s degree in Environmental Studies with the Open University (UK) and is preparing for a Master’s in Biodiversity Conservation and Sustainable Development in the Caribbean with the University of West Indies in 2014.